Double Cherry Palace is the 5th course of Episode 1 in Captain Toad: Treasure Tracker. 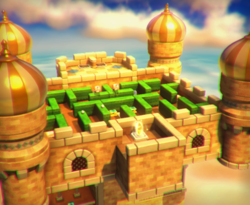 This level takes place in a large Arabian-type castle. Two Captain Toads as a result of the Double Cherry. Captain Toad starts next to a Double Cherry, which is a power-up returning from Super Mario 3D World. The player must use the Double Cherry to clone Captain Toad, and use them to navigate through a maze to hit two P Switches, which unlocks the back side of the castle. From here, the player needs to reach the bottom of the castle, where a two-person platform can be found. This platform will take the player up to the Power Star. Super Gem 1: Given to the player by a mole-enemy in the hedge maze. Super Gem 2: In the back of the castle; inside a secret room on the left side. Super Gem 3: Given to the player by a mole-enemy behind the castle. A hidden 8-bit Luigi can be found in a window on the right wall, just below the hedge maze.